Parking Lot Repair at Harvey’s Beach (Installation of Millings and Parking Lot Space Delineation) Attn. 3. It is understood that the Town of Old Saybrook reserves the right to accept or reject any and/or all proposals and to waive any formalities or informalities. 4. All proposals must be dated and signed by authorized personnel. 5. No prices shall include state or federal excise taxes. 6. Proposals from respondents that do NOT meet minimum qualifications and/or do NOT include and/or satisfy required language and/or items specified in this document will be eliminated from the list of eligible respondents to be considered. 7. Proposals must be received by Noon on Wednesday, June 12, 2013. 8. Responses will be opened and recorded at beginning at 12:30 PM at Old Saybrook Town Hall, 302 Main Street, Old Saybrook, Connecticut. Purpose: The purpose and intent of this Request for Proposal and Invitation to Bid is to solicit proposals and specific itemized pricing from those who meet the qualifications described herein to repair the parking lot of the Town of Old Saybrook’s Harvey’s Beach to include the grading of the parking lot, repair of any sink holes/ pot holes, the installation of millings, the rolling of millings, and the delineation of parking spaces and traffic flow as detailed in the attached drawing. The work area is approximately 209’ x 143’. Hervey’s Beach is located at 27 Plum Bank Road, Old Saybrook, Connecticut. Minimum Qualification Requirements: Must have at least ten (10) years of documented experience in the installation of millings, including making repairs to existing paved parking lots. Must be able to commence work immediately following Town approval and complete the project in full, including “punch list items” by July 1, 2013. (Should the Town approval process not be completed by June 25, a later completion date may be negotiated). Must meet any and all additional requirements and/or qualifications as detailed in this document. 4. Employer’s and Professional Liability must be included in “General Liability” or maintained a separate rider/policy to meet Proof of insurance must be included at time of RFP / Bid Response. If successful, the respondent must provide the Town of Old Saybrook - Office of the First Selectman - with insurance documentation that names the Town of Old Saybrook as an additional insured. Performance / Payment Bond There is no performance bond requirement for this project. Hold Harmless Statement The respondent shall include Hold Harmless Language. The language shall provide a release to the Town of Old Saybrook for issues concerning any claims or injuries of any nature whatsoever that may arise out of the scope of work proposed, to indemnify and hold the Town harmless from any and all claims, losses, damages, judgments, costs, settlements, fines, penalties and expenses (including legal fees) that the Town may incur, directly or indirectly, as the result of the work performed by the respondent on either public or private property as assigned, including without limitation claims, losses, etc. that may result from a claim by an employee of the contractor, a land owner, or a third party. 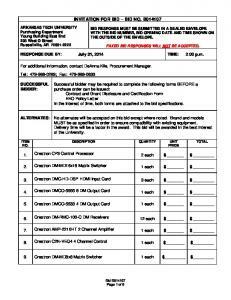 Report "Invitation to Bid For: BID # OEM"